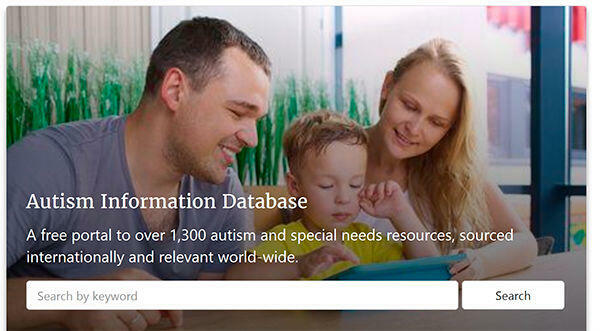 Find reliable, evidence-based resources on ACT’s Autism Information Database – now available as a tool anyone can add to a website! Those of you who follow ACT’s Facebook Page will know that we had a booth at this month’s International Meeting for Autism Research in Rotterdam to spread the word about the Autism Information Database – AID. There were over 2,000 registrants and they all received information about the AID as part of their registration packages! While many of the world’s leading autism researchers now know about the AID, many families are still not aware of this great tool to help them find objective, evidence-informed resources. A simple key word search of 1300 quality resources is likely to product results. There were 2500 AID searches in April 2018, and we would like to double this by August! ACT’s focus is on selecting resources that are practical, family-focused and non-commercial, sourced from reputable websites world-wide. We also have resources that can be helpful to adults on the spectrum. This project is over seen by an international advisory panel to ensure quality. ACT is encouraging other not-for-profits to add the AID link to their websites to improve access to evidence-informed resources for their users. Set up the AID Search on your site in just one step. 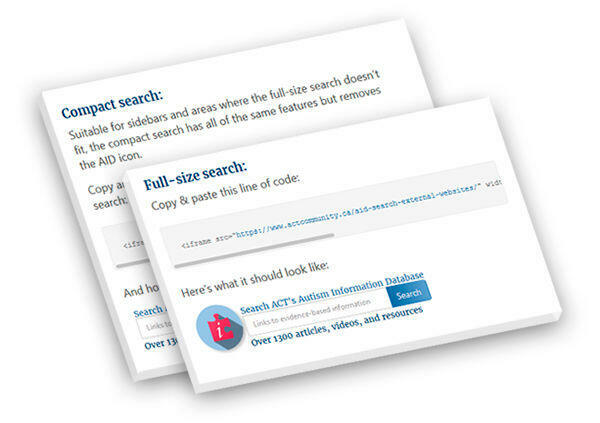 ACT provides two options, full-size and compact, to fit the needs of your website. Contact support@actcommunity.ca for help with setting up the AID Search. Adding the AID Search Bar to your site is simple, only one line of HTML is needed and can be placed anywhere on your site. Materials in translation? We always appreciate submissions in multiple languages as the AID is accessible internationally. This entry was posted in ACT Resources, News on May 28, 2018 by ACT.